He's a cute little guy! Hands and eyes both very expressive! Thanks! Where are your new carvings? One is waiting for photos, the other is on the bench waiting for time to carve. We have had our 20th anniversary this week and a 15th birthday of our son whose party is today. There has not been much time for any carving this week. Sigh. Beautiful and alluring. I tried briefly to carve a nut by first cutting it in two along it's "dorsal" line (top to bottom) and found the center to be a dried cavity. 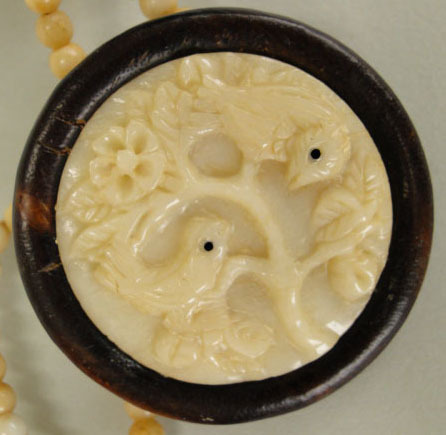 Can you tell me what tools you used - manual and power - to carve Tagua. On my first attempt I found it extremely crunchy and "brittle". Need some technique and tools help. I used rotary tool as main tool, and hand chisels (for woodcarving) for tiny details. Tagua nut is really "brittle" material. So, I could not to delete thick amount of material with my hand tools. But hand tools are good for tiny details carving. If you want, I can send photo of used tools. Let me know, if you interesting. 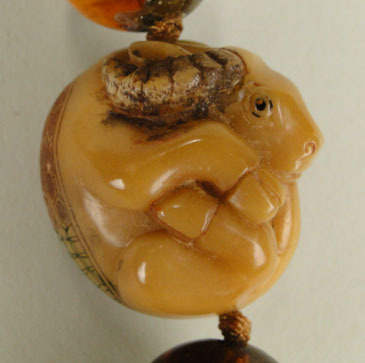 One more amazing netsuke! It is so beautiful!!!!! I love this monkey! Really, very beautiful! I congratulate You! I've visited your site and seen all sides of this monkey, "in progress" too! You are so high-gifted! What are You going to carve now? I so wonder! I have a several ideas but nothing was started while. It is always a big problem, when we have some ideas!!! What to do the first of all? I'm with two ideas, You'll laugh at me, I'm carving both! Probably this advice will help You to start! Yes, please post pictures of hand tools. I am still a "beginner" in all of this and my hardest task has been to find tools that seem to work. Right now I feel like I am trying to paint a portrait of Mona Lisa using house painting brushes. Beautiful job Sergey, especially the eyes which look at you like a child. This the all tools that I used for tagua carving. Not too much. Thank you very much. It looks like basically you use files, chisels, picks and knives. Some appear to be home made. I wonder what the second tool from the left in the third picture of your four hand-made tools is used for. p.s., hope you slept well! This is a very difficult question! I use this tool for much differents works. But I can't describe this - my English is very limited. So, I'm not sure if I can to describe this in my language also. I think, you may switch on your fantasy. Or make this tool and try to use it. I really obstruct to describe this in words, sorry! Welcome Jean and Ersatz! Glad to see you here. Thanks for the interesting information on tagua from all of you! Welcome to The Carving Path. 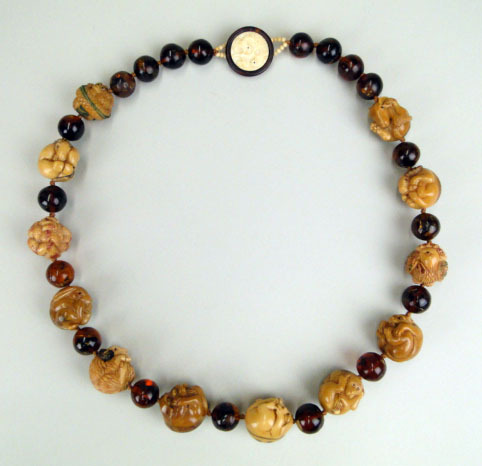 I do not know enough about tagua to inform you about the age/darkening of this material, though I am aware that some tagua does darken over time. I am curious though that you see a definite grain in it. Are you able to get really good close up detail shots of this grain pattern? That would be interesting to see. A test that curls my toes if harm might come to a netsuke or other carved object, is to use a very hot needle to prick an inconspicuous place (inside the cord hole) to see if it melts. If it does, then it is likely a plastic material rather than animal or vegetable (tusk or ivory, or tagua). More information would help the members with helping you. The color may also have come from a stain or dye.